I don't sleep well. On top of the punishment of being a bad sleeper is the punishment of what's on TV in the wee hours of the morning. I turned on the tube at 3:00ish this morning to find Revenge Body, a reality show on E! featuring Khloe Kardashian. I will not go on a Kardashian rant. No one wants that from me. Nor will I assail reality TV. I will report that I could only stomach 15 seconds of the show. Until a moment ago I still had no grasp of what "revenge body" means. It's one of those newfangled terms that serves as a reminder that some of us are old. I was looking for a description of the show and came across this fine summary which also works as a primer on the term "revenge body." If you are of a certain age, you already know what it means. As for me, I can't unlearn this new knowledge. And now my students can look forward to me trying to drop a Revenge Body reference at just the right time during the upcoming semester. I will let you know if I nail it, or, just as likely, if the attempt falls flat. I didn't keep track, but my guess is that I cooked more meals in 2017 than in any year prior. For me, cooking is a fun, and I like the challenge of making meals that my family finds tasty. I don't want to be hollering at my kids to FINISH YOUR MEAL. I want them to enjoy their food. Does it always work out nicely? Hell no. There are many "eeewwws" and unimpressed faces but overall the kids do alright in eating what's put in front of them. Again, I didn't keep track, but I probably spent more time watching Food Network this year than ever before. Funny, the more I watch and become acquainted with new ingredients and new culinary terms, the more I keep things simple in the kitchen. For instance, today's lunch was quesadillas. If you watch Food Network for a few hours on any given day chances are you'll see someone whipping up a fancy version of a quesadilla or taco. But I stay in my simple lane. For the kids I made black bean quesadillas. Using black beans was an easy way to get them some nutritional value. It's common for me to make a slightly different version of a meal for my wife and me. My kids hate zucchini unless it's breaded and fried. So I diced up zucchini and made black bean and zucchini quesadillas for my wife and me. Salsa and sour cream on the side, good to go. All you need are tortillas, a bag of shredded cheese, a can of black beans, zucchini, and whatever you want on the side. I'm big on budget friendly fast and easy meals, always striving for flavor and incorporating some nutritional value. No crumbs on the plate leftover for this lunch. All you need is a sweet potato and microwave. 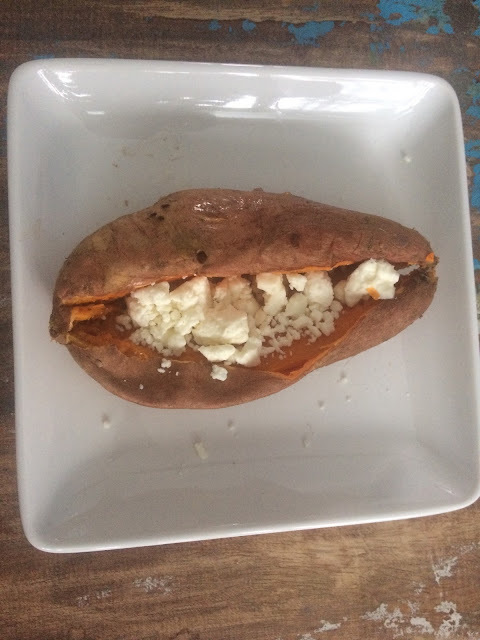 Eight minutes later, lightly butter and sprinkle with feta (already in your fridge, I presume). Delicious and ultra budget-friendly, that's how we do it here at Creative Sociology headquarters. Last night my wife and I went out for dinner. We got engaged this time of year 14 years ago. Each year we try to have a nice night out around the time of our engagement. On the way to dinner we listened to Christmas music. On the way home I put on my favorite station, Sirius XMU. It's indie rock but on this night there was country music playing, including a song by Willie Nelson and Merle Haggard. It was fun to hear a different genre. This was happening on Jason Schwartzman's Coconut Radio program. For those of you who don't know Jason Schwartzman, please watch Rushmore immediately. It's a near perfect film with phenomenal performances from Schwartzman, Bill Murray, and pretty much everybody else in the film. Also, the soundtrack is amazing. Almost every song in the film is great, the best one being "Ooh La La" by The Faces. As usual, I digress. On Schwartzman's show last night, there was a woman who was talking about the country songs that were playing. Because we caught the show midstream, we didn't know who it was. My wife wondered if it was his wife. I couldn't tell if it was his wife or his friend. We didn't have it on long enough to know. It was a busy day here at Creative Sociology. There were several posts today. Plus, it was the staff Christmas party. I'm a staff of one, just me holding the operation down, so I treated myself to a burrito from my favorite food truck. It didn't disappoint. I happily devoured a giant burrito for lunch knowing that dinner would be on the lighter side. This is a recipe courtesy of Max Lowery from his book The 2 Meal Day. I'm not on the 2 Meal Day diet plan. I bought the book for recipe ideas. It's also oddly fun to read about the idea of a 2 Meal Day approach without actually having to follow it. I digress. This is a poor quality picture and I admit to staging the bookmark. I'm proud that I got to see a production of A Charlie Brown Christmas at the Theatre of Youth in Buffalo. It was outstanding. Support local theatre. 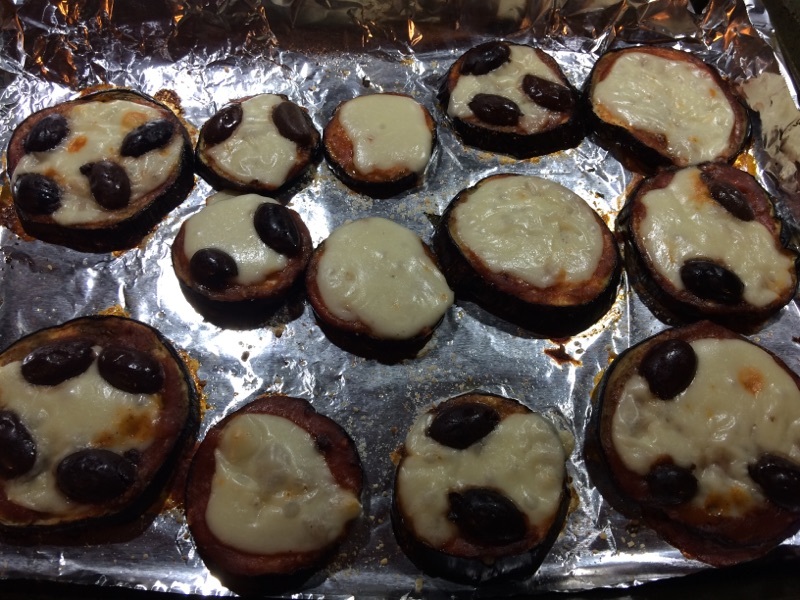 Anyhow, the premise of eggplant pizza is wonderfully simple. Oven at 375. 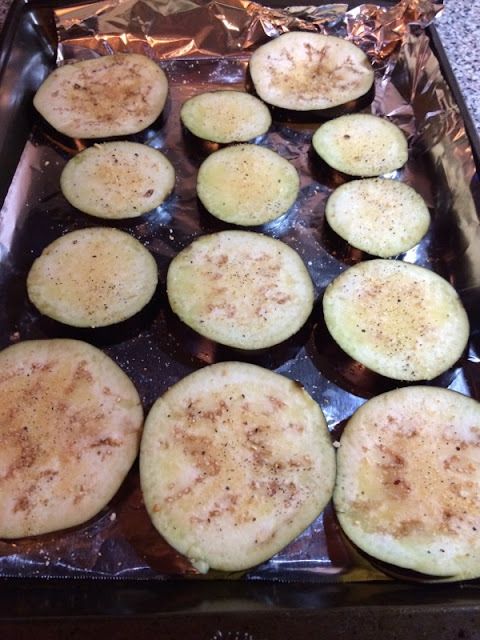 Slice an eggplant and drizzle with olive oil. Season as you like. Put them in the oven for around 25 minutes. Then add sauce, more seasoning, Parmesan and mozzarella cheese and finish them in the oven for 5-10 minutes. Here's my work at various stages. You can see I added kalamata olives because they're delicious. Honestly I was thrilled at how these came out. 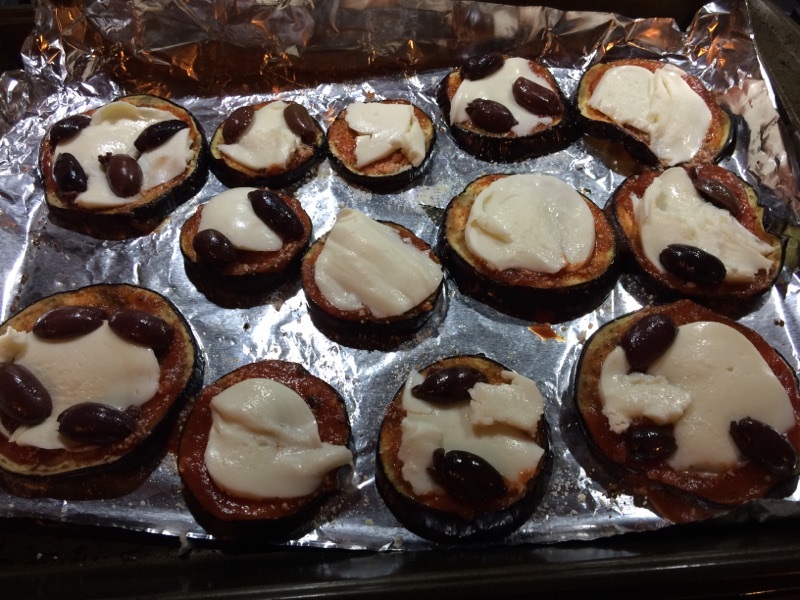 I've never made eggplant pizza before. They tasted better than I expected. I think my seasoning was on point (salt, pepper, garlic powder, and some Mrs. Dash stuff I keep on hand). Don't judge me for using Mrs. Dash -- inexpensive and gets the job done. As a time saver I used sauce from a jar. This was just for wifey and me. The kids (10 and 7) aren't about to eat eggplant. So they had spaghetti with said sauce from a jar. Wifey is a good judge of my food -- if what I cook ain't good she'll say so. She and I both agreed these little pizzas were good and that'd we definitely have them again. 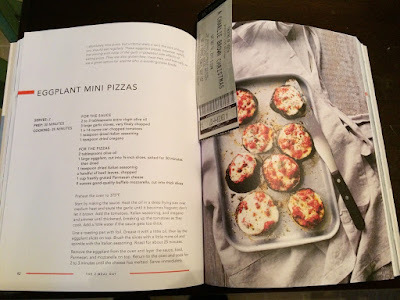 I highly recommend you give this a try, and just make sure to be consistent in your eggplant slices -- don't slice them too thin else they'll wither away. You also of course want them to cook through at the same time. The book recommends 3/4 inch slices and I think that's about what I achieved. Also use decent quality mozzarella instead of the shredded stuff. Since all you have to buy is one eggplant and a jar of sauce, you might as well splurge on the mozzarella. If you don't like kalamata olives try another topping. Or don't, it's your life. As you can see in the picture, I didn't use them on all the pizzas, and the plain ones were very good too. As I'm feeling my way to a new project I'm calling Immersed in Suburbia, I'm getting back in the practice of doing observations. This morning I hit up a Target near my suburban home, and decided to sit in the Starbucks "cafe" after finishing up my shopping. I decided not to use a notebook, figuring I'd just type notes on my phone. Plus it's 2017 and who sits around with a little notebook? So I sat at the "cafe" for an hour sipping coffee. I have "cafe" in quotes because I'm not sure what to call the Starbucks space that is adjacent to the check out lines where they have 5-6 tables. It's not an inviting space to stay. I didn't see anyone here doing work or conducting business as they might in an actual coffee shop. Most people grab and go. This was a boring space to observe. But in a way, it was the perfect place to observe and watch the wheels of capitalism go round and round. From my vantage point I watched people come through the line and either make their way to the Starbucks counter or to the exit. I quickly remembered that in doing observations one must get comfortable with the waiting. It's okay when "nothing" happens. This is something I recall Peter Moskos writing about for a chapter in the book New Directions in Sociology. He's got a chapter entitled "In Defense of Doing Nothing: The Methodological Utility of Introversion". So I sat, observed, typed notes in my phone, texted my wife (because that feels normal), and waited. That's a section I'll have in my field notes. SOUNDS. There were several babies crying and the crying was loud and I know from my experience not so long ago that it's often a feeling of embarrassment when your baby is crying. Whenever my kids were babies and in crying mode I remember feeling self-conscious as a parent like the world is looking at you judging you "Hey parent can't you get your kid to stop crying and why are you out in public anyway?" I still try to give a half smile or an acknowledging nod to a parent with a crying child but I don't think it usually gets interpreted as parental solidarity. I think it's more like "Hey old guy why are you nodding at me you're weird". The other sound I heard a lot was the phrase "Merry Christmas". The Starbucks workers were exchanging the phrase with customers. It was pleasant. What I didn't see (because I try to be mindful of what I'm not seeing or hearing) is people freaking out or being angry. It remains my contention that people are generally terrible and I'd fully expect people's terribleness to come out so close to Christmas with the last minute consumption pressure so strong but in this rare case people were behaving in a congenial way. Let me say I spend a lot of time in Target and on many occasions I've seen people scream at workers and be awful. Here's one such case I wrote up. During my brief observation today, however, people were gentle. My main observation today is in the form of a question for the Starbucks crowd: Is Starbucks a gendered experience? The whole time I sat in the "cafe" today, it was only women buying coffee and gift cards. I was only there for one hour -- obviously I can't make much out of an hour -- this is why I am asking. At one moment there were 6 women waiting in line. The line kept changing and it was one woman after another. One waited with her baby in a baby carrier. She swayed back and forth and I didn't hear the baby make a sound. Chilling with a baby in a carrier is a skill I never mastered when my kids were little. Anyhow, is there such a thing as a "typical" Starbucks? In a regular Starbucks (one not affixed to Target), are there any gender patterns to observe? And that's so true. People talk to me all the time in public. ALL THE TIME. Except for this time, lol. No one spoke to me during my hour of observation at the suburban Target-Starbucks (Tarbucks? Starget?) near my home. Now that the semester has ended, there is time to catch up and reflect. There was a moment in one of my classes when we talked about relationships. It was my Social Psychology course. I can't remember the context, but we arrived at the point of saying that in a relationship it feels horrible to be made to feel like a burden. This was a course with mostly juniors and seniors. After class I typed one sentence in my iPhone notes: "I'm sorry I'm a burden to you." It remains in my notes and I'm looking at it today. There is no place for this sentence to go, other than this blog. I like the idea of it as a poem. Or as a line in a play: "I'm sorry I'm a burden to you." Or as the basis of a song. Being honest, in our relationship history we have both probably made others feel like a burden and been made to feel like a burden. In any direction, it doesn't feel good. Do you remember The Sundays? A talented band that helped usher in the best decade in civilization, the 1990s. They made a beautiful song called Here's Where the Story Ends. You certainly know Blondie and the super cool rock star Debbie Harry. What happens when you cross The Sundays with Blondie? You get Plimsoll Punks by Alvvays. I dig this song.